The Betaminic Books are here!!! Betaminic.com > The Betaminic Books are here!!! Research and Analyse Successful Strategies for Soccer with the Free Betamin Builder Tool. Includes a new methodology and 8 winning strategies in the Proven8 System. Paperback and Kindle formats available. Downloadable PDF for FREE! This book is the second in the series. 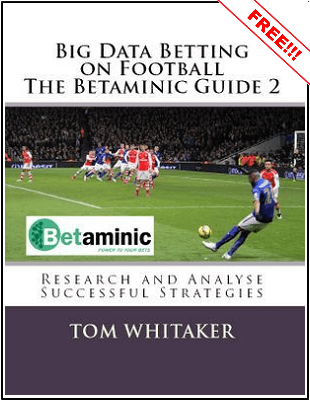 It is a follow on book from “Winning Sports Betting Strategies with Betaminic”. The first book included a step-by-step tutorial of how to use the Betamin Builder tool, the Colossus21 strategies, Betaminic 9 public strategy factsheets and also staking, banking and other betting advice. This second book will explain a new methodology that aims to reduce the chances of creating strategies that are just based on data mining and will not lead to positive results. Eight improved strategies based on this methodology are then presented in the Proven8 that makes an average of 18 points profit per month with about 180 bets per month, a yield of 10% and 89% of months being profitable. Finally, it will be shown how these strategies can be used together with existing strategies to create my recommended Multi19 system that I currently use which makes an average of 47 points profit per month needing about 600 bets per month. Get the two Betaminic books and bonus material for free by becoming the author referral. Just click on the link below, sign up or login to Betaminic, buy any pick package and email the order number to the author.